These living snack food mascots had a curious symbiotic relationship with the unnamed planet that was their home. Visitors to that world inevitably became more bestial before mutating into anthropomorphic cats with the unlikely ability to spontaneously teleport themselves across light-years of space to hunt fresh prey. Unfortunately, the aggression of the Cheetah People was in turn causing the planet to shake itself apart. Things only got worse when the Master–partially transformed into a feral creature–engaged the Doctor in a violent struggle. Fortunately, the Cheetah world’s influence allowed the Doctor to zap himself back to England before the final fireworks. 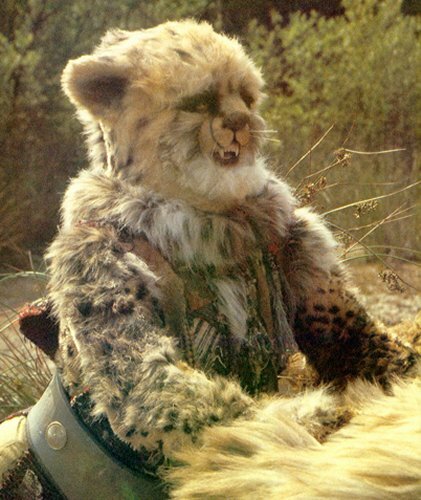 The Cheetahs themselves vanished to parts unknown, though some later found lucrative work at “furry” conventions. But that’s a story for another blog.